Product Features Size: 16 in. 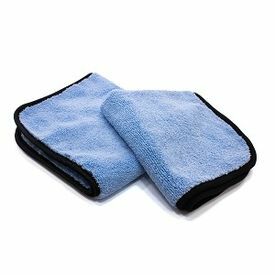 x 16 in.Fabric Weight: 530 grams per square meter (GSM)Towel Weight: 84 grams (approx. )Fabric Blend: 75% Polyester - 25% Polyamide - 100% Split MicrofiberEdge: Silk or Cloth ( COLOR OF THE LINING MAY VARY FROM WHATS SHOWN IN THE PICTURE)Country of Origin: Made in ChinaLabel: Sticker Highlights: Super Soft and Plush Easy to remove sticker, not sewn into the cloth 530 GSM, highly dense microfibers Great value for money, similar cloths sell for much more ( if at all available) Whats in the pack?One Microfiber Cloth Questions: 1. What is this useful for? A: Water less Washing, Wax Removal and Buffing, Wet Wiping the exterior, does so gently and avoid scratching the car. 2. Is this a Branded Microfiber? If not, how can i be sure its of good quality? A: This is from suppliers who make for leading brands. Once a brand sticker is put, this sells for 40-50% more than its current value. We do NOT just put anything for sale, we have used this extensively for our own usage, found it superior quality to anything that sells locally and then decided to offer to those who want a high quality MF 3. What care is needed ? A: Like for any microfibers use a high quality detergent and not powerdered ones. Wash gently and do not use a washing brush or wring the cloths, just squeeze Tip: Before using it first time just wash once with water only. Trust us, this MF will wow you like none. If there was a way we could make you believe it, we would but go with our recommendation as we use nothing but the best in our detailing needs and this is the best MF for the money you pay!